Do solar panels increase the value of your property? Will having a rooftop solar PV system make it harder to sell your home? The answers to these common solar questions can often make the difference between installing solar or not, especially if you’re likely to sell the home and move within the near future. Everyone wants to increase the property value of their home before they sell it, not see it decrease, so when investing in a home improvement project, it’s key to stick to those that both increase the comfort of the homeowner and boost the value of the home with retained value. Not too many people want to strand their money in adding an asset, no matter how beneficial it is at the time, if it won’t pay for itself when selling it later. The good news is that solar homes are going for a premium these days, and although we’ve addressed this topic of increased solar home value before, a recent study confirmed what many in the solar industry already know, which is that solar adds value and offers a great return on investment. The study, Appraising into the Sun: Six-State Solar Home Paired-Sales Analysis, had experienced real estate appraisers using an industry-standard paired-sales valuation technique to analyze the property values in six states. The valuation compared recent sales of comparable non-PV homes with their solar PV home counterparts, and found that solar increased home property value across the board, with variations by location, size of system, age of system, and other factors. Although the appraisers found solar home premiums “highly dependent” on the specifics of the system and the differences in individual real estate markets, solar PV systems were valued at at an average of $3.78 per watt, or about $14,000 for an average-sized system of 3.8 kW. 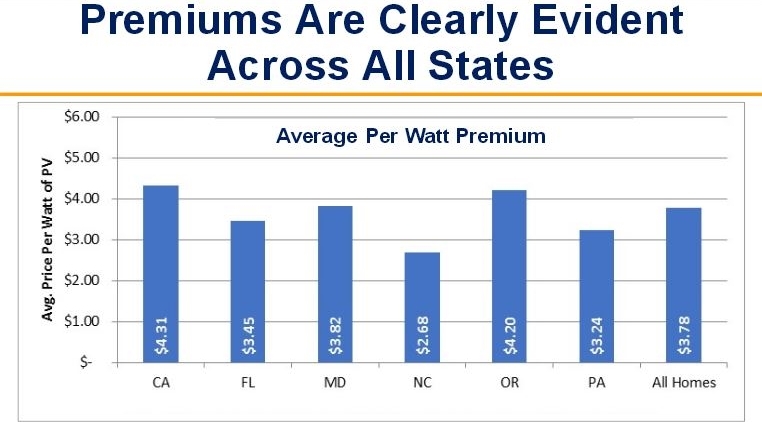 The premiums varied by location and specifics from $2.68/W to $4.31/W, and the study concluded that price per watt was the appropriate valuation metric when appraising solar PV systems, which can be of help as we continue to see more solar homes bought and sold in coming years due to the emerging rooftop solar trend. On the low end of the valuations, in the Raleigh, North Carolina, metro area, the average premium for solar PV was found to be $11,229, or about $2.68/W, and accounted for 3.61% of the selling price. Solar homes in southeastern Pennsylvania had an average solar premium of $16,377, or $3.24/W, accounting for 3.73% of the sale price. On Florida’s Gulf Coast, solar homes earned an average premium of $12,760, or 6.39% of the selling price, at $3.45/W. Baltimore’s solar home sales garnered a premium of $13,667, or $3.82/W, and accounted for 2.52% of the homes’ sale prices. Homes in Portland, Oregon, received an average solar premium of $10,600, accounting for about 3.25% of the price at a value of $3.92/W. Bend, Oregon, solar homes were worth an average premium of $22,775, at about 5.41% of the sale price or $5.50/W. At the top end, in San Diego, California, the average premium for a home with solar PV was $17,127, at $4.31/W, and accounted for 3.37% of the selling price. The study also found that solar PV didn’t hinder selling times for homes, with no consistent difference in the number of days that non-PV homes and solar homes were on the market before selling. This aspect of the analysis can help allay fears that installing home solar can make it harder to find a buyer later on, and may also increase the desirability for realtors to list homes with solar PV on them. This solar home value analysis was supported with funding from the US Department of Energy’s SunShot Initiative, which seeks to drive the innovation necessary to make solar energy “fully cost-competitive” with conventional energy sources by the end of this decade. The study can be found at the Lawrence Berkeley National Laboratory website. Found out how to put solar to work for you today, tomorrow, and beyond!